Good Friday is just a week away and we are very excited to celebrate out risen Savior! Last year, I created an Easter story coloring book and mini reader for my daughter who was two. Now that she is three, I wanted to make it more interactive for her. I revised the coloring book and mini reader and added a bible verse tracing version as well! 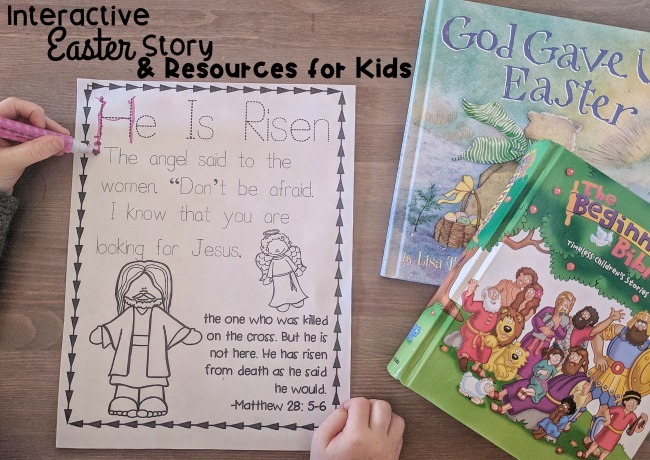 This version of the Easter story has parts for tracing bible verses as well as coloring pictures. Emma really enjoyed this! She didn't trace all of the verses but we read through it a few times and it was simple enough for her to understand. You can grab it HERE! This coloring book version has the same content as the other books but is black and white with pictures for coloring! It is much smaller and prints two pages per full page for printing. You can grab it HERE! This version is the same size as the coloring book version but it is in full color! We've been reading through this one as well and both kids really love it, you can grab it HERE! We've also really enjoyed The Beginner's Bible, God Gave Us Easter, and The Story of Easter for more resources. We hope you take the time to talk to your kiddos about the significance of Easter and spend the coming week remembering the sacrifice that was made for us!